The crown of a tooth consists of the visible part that extends beyond the gum line. Crown lengthening removes gum tissue and bone in a surgical procedure, exposing more of the tooth. The procedure doesn’t actually increase the length of the tooth. It simply makes more of it visible. A small or damaged tooth can require the addition of a crown to restore it to proper health. Restorations that don’t fit properly can irritate the gums, cause inflammation, and leave room for decay to develop. Crown lengthening can enable a tooth to support a restorative crown when not enough of the tooth extends beyond the gum line. This problem can occur for many reasons. The tooth has broken off at the gum line because of decay or trauma. The tooth is unusually small. Some teeth form in unusual shapes and sizes, either because of genetics or because illness disrupts tooth formation when the patient is a baby. The tooth is reduced in size after the removal of substantial amounts of decay. In these cases, crown lengthening aids in restoring a healthy tooth. Crown lengthening also forms part of the process of correcting a “gummy smile,” one in which so much gum tissue surrounds the upper teeth that they look too short for facial balance. This excess gum tissue detracts from the patient’s appearance and provides a breeding ground for the bacteria that cause periodontal disease. Periodontists typically perform crown-lengthening procedures using local anesthesia. The periodontist makes incisions into the gum tissue and removes part of it, usually reshaping the bone around the tooth as well. Tiny sutures close the incisions. Dressings keep the area stable while it heals from the surgical procedure. To promote proper healing, it’s best to avoid heavy exertion from exercise, work, or any situation that involves lifting heavy objects, all of which can cause bleeding and slow down recovery. Post-surgical recovery typically involves taking pain medication (prescription or over the counter). An ice pack helps reduce swelling immediately after surgery. A soft diet, with nothing hot, spicy, acidic, or sticky, also helps promote healing, as does avoiding alcohol and tobacco. It’s also important to leave the surgical site alone, chewing on the other side of the mouth and keeping fingers, food, floss, and the tongue away. During recovery, patients can brush the rest of the mouth normally, but should avoid all except the biting surface of any tooth that was restored. Warm salt water rinses are recommended for the first week. 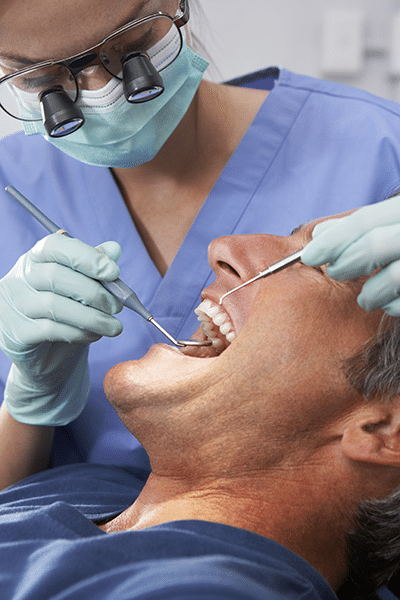 After the gum tissue achieves its final contours, a dentist can add a crown to complete the restorative procedure. How long the area must heal depends on the extent of the procedure. A small amount of gum contouring will require less healing time than a more-extensive procedure that also involves reshaping the dental bone. The tissues in the area need time to recover from post-surgical swelling before any further restoration work can begin. If the crown lengthening was designed to correct a gummy smile, the patient may not need additional treatment after the mouth heals from crown lengthening.